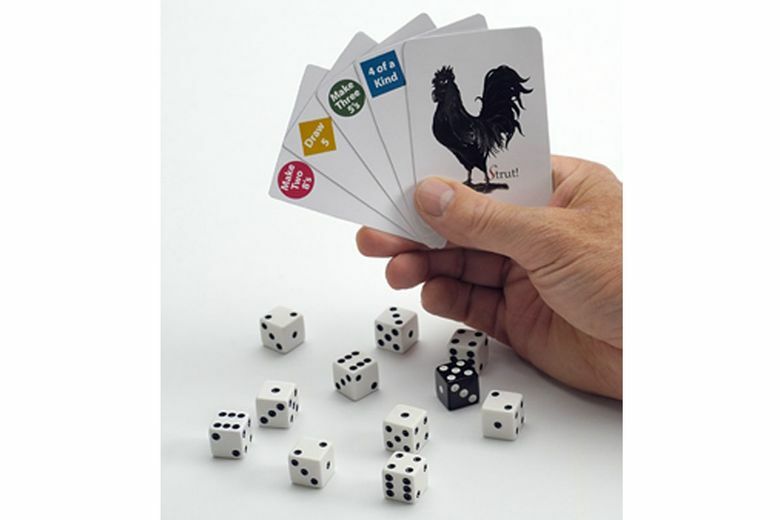 Celebrate the 10th anniversary of Strut!, a fun, fast local card and dice game. Grandma has gin rummy. The little kids have Go Fish. But those in-between will prefer Alsip & Company’s Strut!, a fast and furious game of chicken. Made in Seattle, the card and dice game celebrates its 10th anniversary this year and remains a best-seller at local game stores. Easy to learn, and small enough for a Christmas stocking or travel bag, Strut! involves matching the numbers on the cards with those rolled on the dice. Get rid of your cards before your opponent and you win. But watch out: Rooster cards can upset the game and scratch out your victory.